Miserere nostri Domine, Mass for Four Voices, Loquebantur variis linguis. A recital on the reconstruction of the original 1517 ‘Swallow’s nest’ organ (Hochwandorgel) in the Stadtkirche (Temple Allemand) Biel/Bienne. Music by Anon, Dunstable, Preston, Tallis, Byrd, and Bull, the latter played on the Hauptorgel. Spitalfields Music has been an extraordinary musical and community success since its foundation 40 years ago. Starting life with a 1966 concert to help save Nicholas Hawksmoor’s architecturally important Christ Church Spitalfields (which was then, unbelievably, under threat of demolition) it soon grew into a ‘Summer Festival of Music’ led by Richard Hickox. Initially under the auspices of the Friends of Christ Church, it became an independent organisation and charity in 1989, setting up their continuing community and education programme two years later. Under the artistic and managerial leadership of the likes of Judith Serota, Michael Berkely, Judith Weir, Jonathan Dove, Diana Burrel, Abigail Pogson and the current Chief Executive, Eleanor Gussman, it has grown into an major musical and community force in London, sharing their passion for music with nearly half and million people, attracting more than 325,000 audience members to events in more than 70 venues in the Spitalfields and Tower Hamlets area. Alongside their Summer and Winter Festivals, they run an enormous Learning & Participation programme involved more than 125,000 people. Lamentations of Jeremiah I/II; In pace, in idipsum; Lord have mercy upon us: Short Service ‘Dorian’ (Responses, Credo, Sanctus, Gloria); Not every one that saith unto me; Solemnis urgebat dies; Sancte Deus; Dum transisset Sabbatum; Why brag’st in malice high; Salvator mundi I; Te deum ‘for meanes’; Come, Holy Ghost. Tallis: When Jesus went into Simon the Pharisee’s house. If you are mathematically minded, this might be the CD for you. Some of the most complex examples of English contrapuntal wizardry from Tallis and Byrd are balanced by more recent, but equally complex and evocative music, from the Estonian composer, Arvo Pärt. As the programme note explains, “Here, Tallis and Byrd meet Pärt on common ground”, although at times, Pärt’s music can sound earlier than that of Tallis and Byrd with its sense of mediaeval structure and texture. This CD will whet your appetite for The Sixteen’s 2016 Choral Pilgrimage, when you can experience this music performed live in some of the most beautiful venues the UK can offer. Honor, Virtus Et Potestas; Candidi Facti Sunt Nazarei; Homo Quidam Fecit Coenam; Ave, Dei Patris Filia; Christ Rising Again; Out from the Deep; Short Service: O Lord, Open Thou Our Lips; Venite; E’en Like the Hunted Hind; Expend, O Lord; Te Deum; Benedictus; The Lord Be With You; Litany. 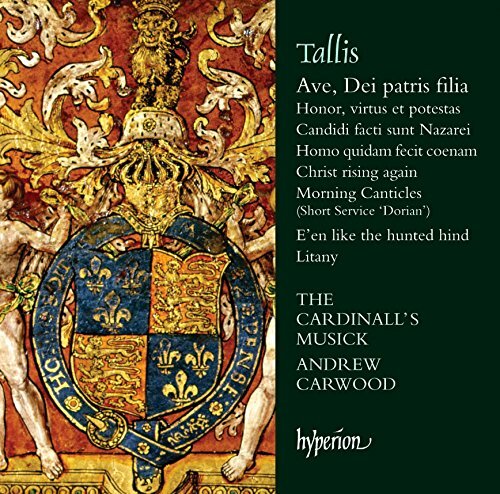 The latest release in The Cardinall’s Musick Tallis Edition focuses on some lesser-known, but nonetheless fascinating pieces. The piece that gives the CD its title is one of Tallis’s earliest works, but probably not the first. It is nearly 16 minutes of rather convoluted praise to the Virgin Mary in which Tallis shows a considerable amount of early promise, not least in some of what was to become his trademark harmonic twists and turns. Detective work by David Allison has not only reconstructed the work from its surviving incomplete state, but has also explored the similarities between it and Robert Fayrfax’s setting of the same text. I would have preferred it to have started the disc (not least to match the order of the liner notes), but it appears after three opening Latin Responsories, the only other pieces in Latin. Parsons: The Song Called Trumpets; Tallis: Loquebantur variis linguis; Mundy: Adolescentulus sum ego; Byrd: Canon Six in One, O salutaris hostia; Aston: Hugh Astons Maske; Gerarde: Sive vigilem; Bevin: Browning; Ferrabosco: I Da pacem Domine; Lassus: Ubi est Abel; Hollander: Dum transisset Sabbatum; Tallis: Suscipe quaeso Domine; Taverner: Quemadmodum; Mundy: Adhaesit pavimento; Baldwin: Coockow as I me walked; Sheppard: Ave maris stella. Palestrina: Lamentations, Gesualdo: Tenebrae Responds, Victoria: O Domine Jesu, Mass: Ave Regina, Ave Regina Coelorum, de Monte: Super Flumina Babylonis, Tallis: Lamintations I&II, In Jejunio et Fletu, Derelinquit Impius, Byrd: Emendemus in Melius, Guerrero: O Domine Jesu. William Byrd, John Bull, Thomas Tallis, Thomas Tomkins, John Blitheman & Orlando Gibbons. 2013 Taylor & Boody Opus 66 organ, Sidney Sussex College, Cambridge. The programme on this CD is designed to demonstrate the new 7-stop chamber organ in the Chapel of Sidney Sussex College, Cambridge. It is designed in a 16th to early 17th century Dutch/North German style, one arguably similar to that of the English organ of the same period, about which we know very little as far as the sound is concerned. The programme covers the English organ repertoire from about 1540 to 1637. Tallis’s Ecce tempus idoneum and the anonymous Bina caelestis and Magnificat include chanted verses sung by the men of Sidney Sussex College Choir in the ‘alternatim’ tradition of the period. The musical highlight is Farr’s magnificent performance of Thomas Tomkins’s monumental Offertory, at over 17 minutes long, one of the most complex examples of a uniquely English genre. It was very likely influenced by the two large-scale Tallis examples in the Fitzwilliam Virginal Book. Stephen Farr’s control of the pulse and build up of tension in this remarkable piece is exemplary – he demonstrates similar skill in Orlando Gibbons Fantasia (the Fancy in Gam ut flat) and the concluding Byrd A Fancie, from ‘My Ladye Nevells Booke’ (1591). Tallis himself is represented by two verses on Ecce tempus idoneaum, featuring the prominent ‘false relations’ so typical of Tallis. The earliest pieces are from the enormous British Library Add. 26669 collection, dating from around 1540/50 and later owned and annotated by Tomkins – the hymn setting of Bina caelestis and a Magnificat by an anonymous composer that could well be Thomas Preston. The secular repertoire is represented by John Bull’s Galliard ‘to the Pavin in D sol re’ and Coranto Joyeuse, the latter using the delightfully pungent Vox Virginia reed stop. Although he allows himself an occasional flourish (notably in the anonymous Bina caelestis) Farr’s playing is methodical in a way that is entirely appropriate for recordings. His interpretations will repay repeated listening, with no risk of annoying mannerisms. In live performance one might expect a little more flexibility in interpretation, but such individualisms can be tricky when set in recorded stone. His articulation and touch are attractively subtle. We can hear the occasional slight pairing of notes (for example, in track 4, John Bull’s In nomine II) but he otherwise wears his period performance credentials lightly. The organ sounds very effective in this repertoire, and speaks into a helpful acoustic. It is tuned in a very appropriate (but not quite meantone) temperament devised for the restoration of the famous late 17th century Schnitger organ in Norden, Germany. A reasonable solution, not least as there are several parts of the English organ repertoire of this period that can sound weird in meantone temperament, even if that could well have been the tuning of the period. The CD notes include comprehensive essays on the music (by Magnus Williamson) and the organ (by the organ builder, George Taylor).